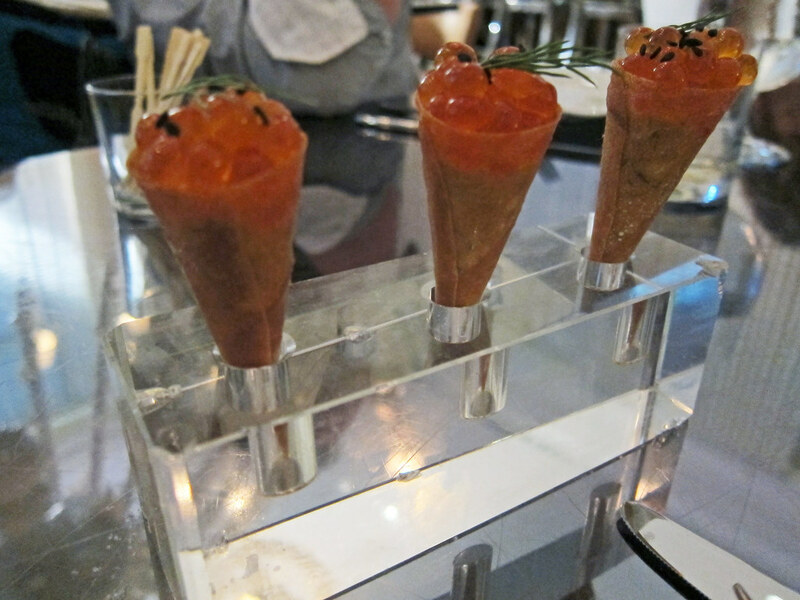 Maybe your first bite should be the "Bagels and Lox" ($7 per piece) - a delicate cone filled with a dill cream cheese and crowned with glistening salmon roe dotted with black sesame seeds. 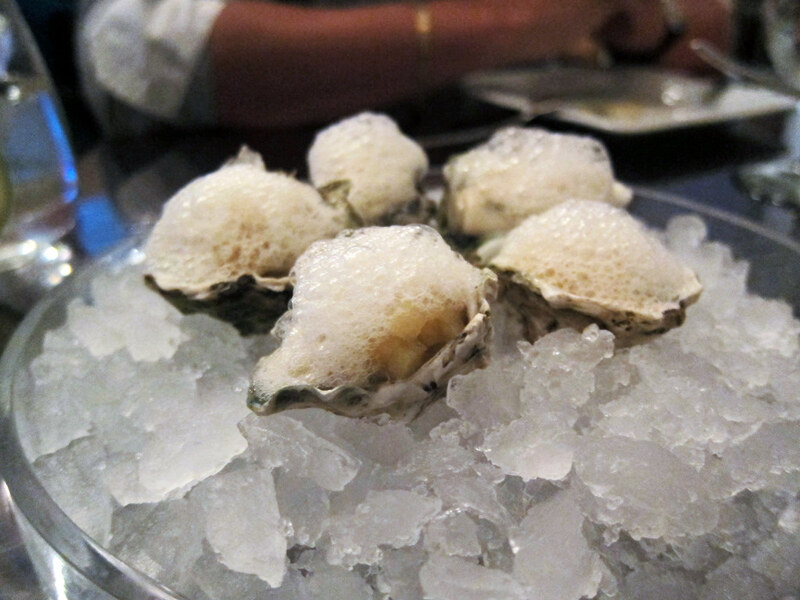 They were serving these back in 2008 at minibar in almost exactly the same fashion - of course, they were serving a cornet with salmon tartare and creme fraiche at French Laundry well before then - and it's still a great bite. Or maybe start with one of the "Latas y Conservas." Though "canned seafood" may bring to mind Charlie the Tuna, Spain produces some exquisite - and often extremely expensive - canned seafood products. Bazaar doesn't actually use such items, though - instead, it's just the presentation that pays homage to the Spanish custom with freshly prepared items like "Mediterranean Mussels" ($10), served cool in a paprika-laden escabeche with some finely chopped carrots and onions, or "Aceitunas Rellenas" ($9), green olives stuffed with briny anchovies and piquillo peppers, marinated in olive oil flecked with brightly flavored orange rind (you can get the recipe here). The "Singapore Connection" is a tenuous one: according to the menu, it's that "In the 1930s, both Miami and Singapore embraced the architectural revolution that became known as Art Deco. Both cities equally adapted the style as it represented decadence, extravagance, elegance, functionality and modernity." My sense is that's just an excuse to serve some Asian street foods, which have been garnering an increasing amount of Chef Andrés' attention. China Poblano in Las Vegas is founded on a similar conceit. If that justifies serving items like "Kueh Pai Ti" ($16), I'm OK with it. These traditional Singapore street snacks feature crispy little pastry cups, filled with tender shrimp, diced vegetables, chopped peanuts, all laced with some chili sauce to make the flavors really pop. It's a great bite, a happy tumble of textures and flavors. 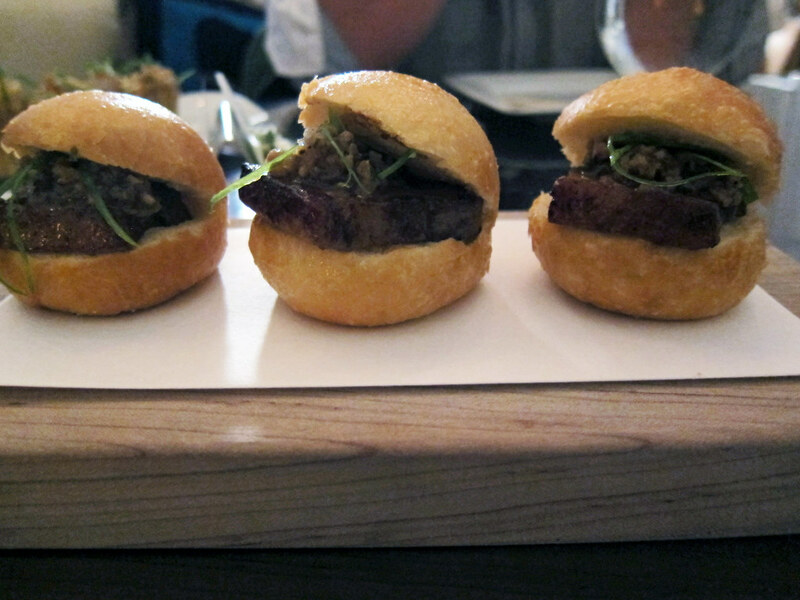 Likewise for the "Bao Con Lechon" ($18), slabs of burnished pork belly squeezed into a puffy "bao" that's actually deep fried brioche dough. On our first visit these tasted monochromatically salty, but there's been ongoing tweaking over the first several weeks, and for our second sampling, a slathering of mojo added a much needed note of contrast. From there, the thematic string gets stretched even further, but Bazaar is a restaurant, not an essay, so let's not get too bogged down in such details. Fish dishes run the gamut from traditional to contemporary, and from Eastern (Asian) to Western (Caribbean). 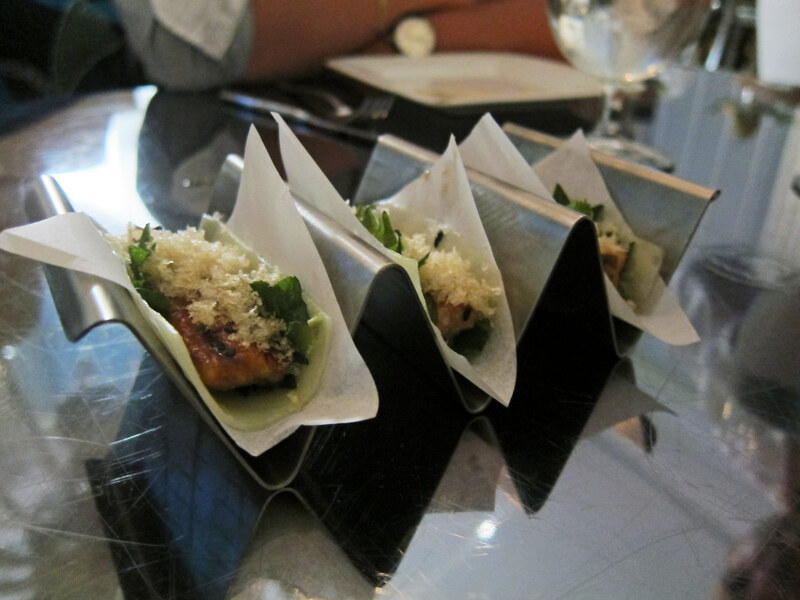 On the more Eastern, contemporary side of that scale, and with a nod to the China Poblano East/West street food theme, are the "Japanese Tacos" ($10) - a sheet of thinly sliced cucumber serving as the tortilla, stuffed with grilled eel and garnished with julienned shiso, wasabi and fine gratings of pork chicharrones. We were told these were one of the most popular items on the menu, and I can understand why. It's a nice, clean, light bite, but still packed with flavor. Falling on the more traditional, Western side of that scale is the Cuban Escabeche "Estefan's Way" ($19). Escabeche is a pickled fish technique that can be found throughout the Caribbean. Here the flavors of sour orange, pickled onion, capers, oregano and paprika are all traditional Cuban, but the use of slices of silky hamachi, assembled in a rough mosaic, makes for a particularly elegant version. The "Liquid Mango Nigiri" ($18) violates, in extreme fashion, my personal rule against messing around too much with uni, which is perfectly wonderful on its own; but the combination of sea urchin, spherified mango (which gushes liquid when pressed), pickled sansho pepper and shiso leaf, all intended to be wrapped up in a sheet of nori, works on its own terms. 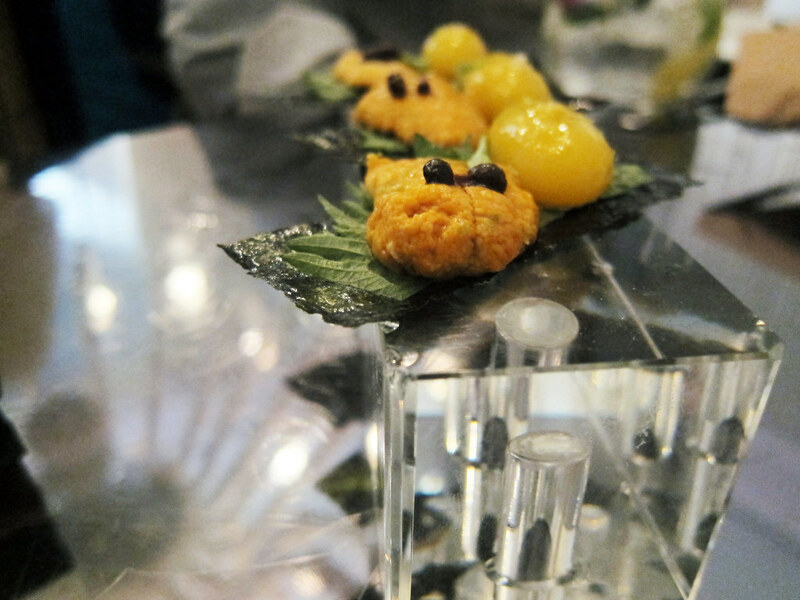 I couldn't say the same about the "Dragon Fruit Ceviche," ($16) perhaps the most alien-looking dish I saw in all of my visits. I've just about given up on dragon fruit, which looks spectacular but otherwise has little redeeming about it, and this dish wouldn't convince me otherwise. 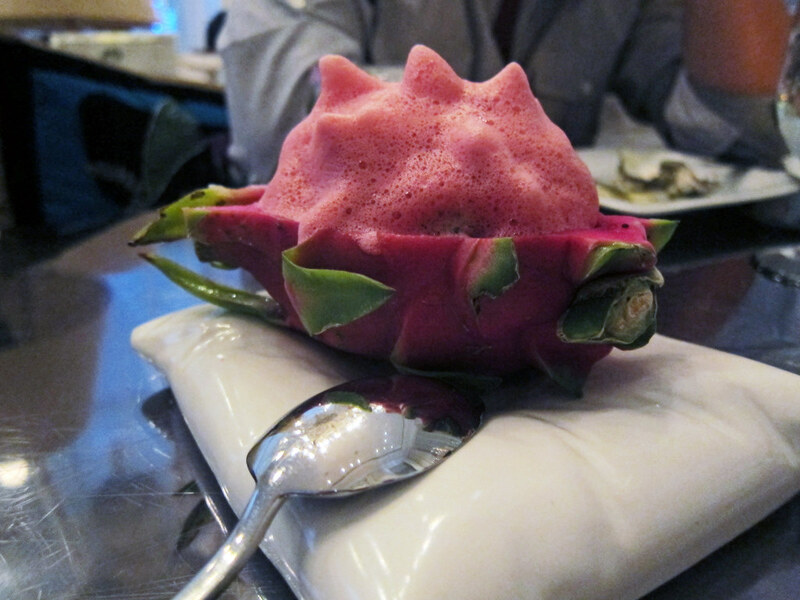 Lurking within that spiky, hibiscus foam was a ceviche of tuna, studded with, among other things, pecans. There was nothing about this that appealed to me: the flavors were overwhelmed by a sour component, the nuts were incongruous, the textures were indistinct and muddied by that hefty dose of foam. Let's instead move on to one of my favorite dishes: the "Papas a la Huancaina" ($24), an intriguing spin on a Peruvian staple. If, like me, you struggle to overcome uni puritanism, then maybe instead get the "Sea Urchin Toast" ($24), with nothing more than butter, black pepper and some finely chopped herbs. This is arguably yet another take on the "controversial" uni panini, and it's hard to go wrong with this formula. But this also highlights one of the peculiarities of the menu: while there are more than 60 choices, certain ingredients tend to repeat themselves. 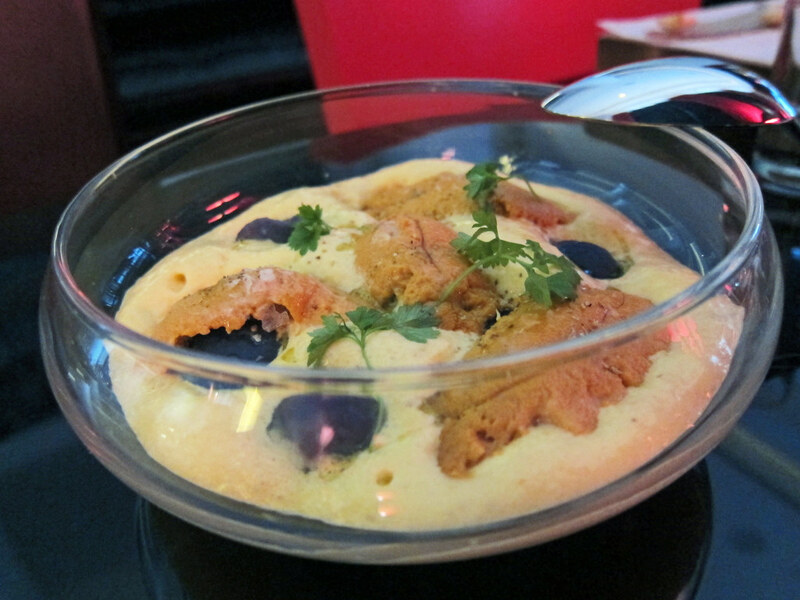 There are four uni dishes; at least three dishes make prominent use of foie gras. Now these are some of my favorite things, so it's not necessarily a complaint, but crafting an order without repetition does sometimes require a high degree of attentiveness. 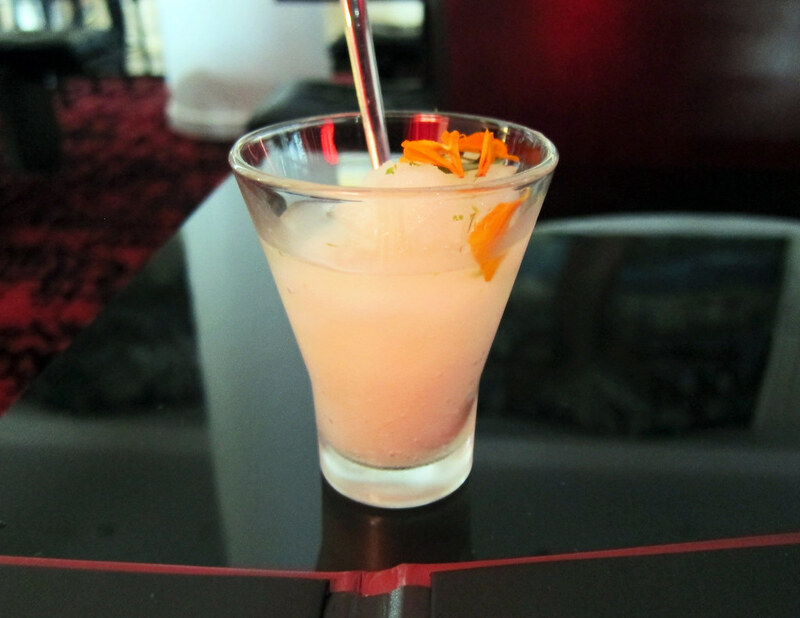 Speaking of foie gras, another of my surprise favorites was a "Colada Cubana" "yogurt" with foie ($14). 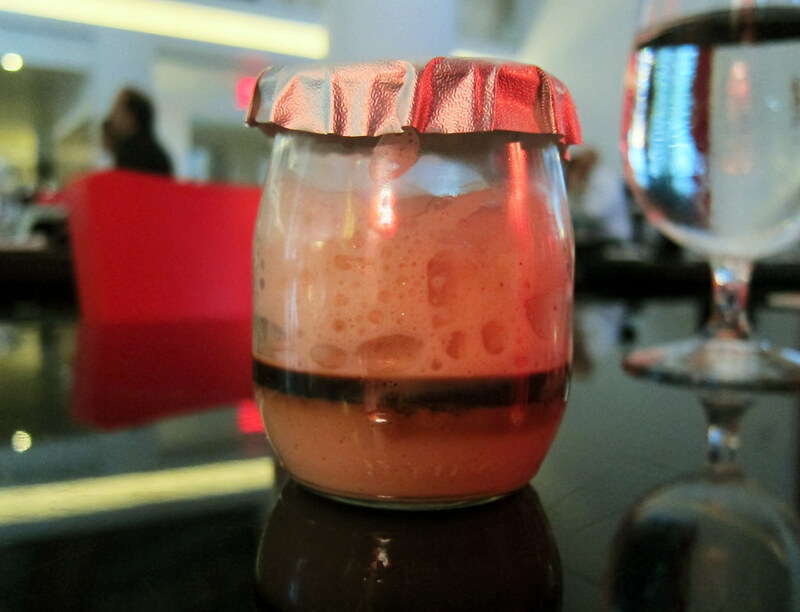 A creamy base topped with a thick syrup and then a fluffy foam, all encased in a small yogurt jar, brought together the flavors of bittersweet Cuban coffee and lush duck liver. It was one of those unlikely combinations that make perfect sense when tasted. Other "yogurts" include Almond ($12) with thickened almond milk studded with fresh almonds and topped with an icy tomato granite, and Sea Urchin ($14) with seaweed and ponzu. Take a breath - we're not even halfway through the highlights of the dishes I've tried, much less the whole menu. 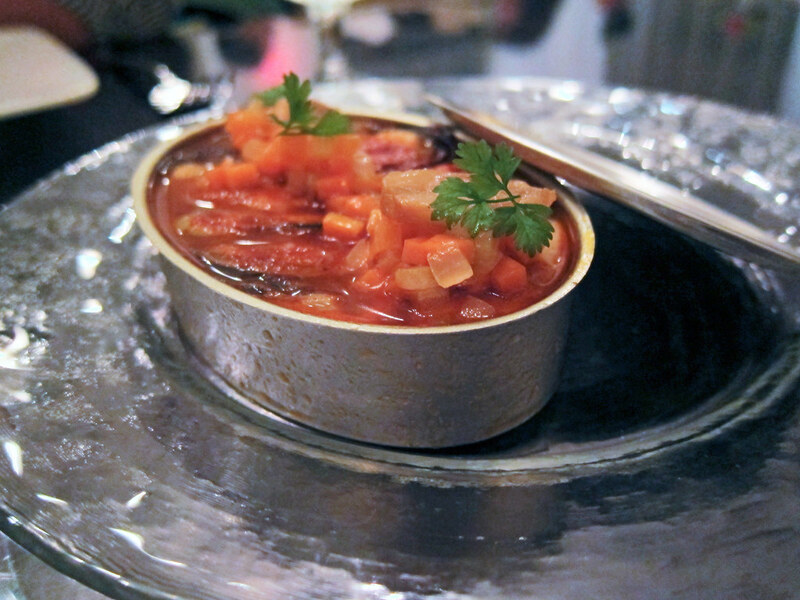 The "Smoked Oysters" ($15) make for a dramatic presentation, brought to the table nestled in ice and hidden under a smoke-filled cloche. But the smoke is actually done with a pretty delicate touch, and the more dominant complementary flavor is the apple mignonette, which presents itself in about three different forms (a gel, tiny bits of compressed apple, and at least one more I can no longer recall). 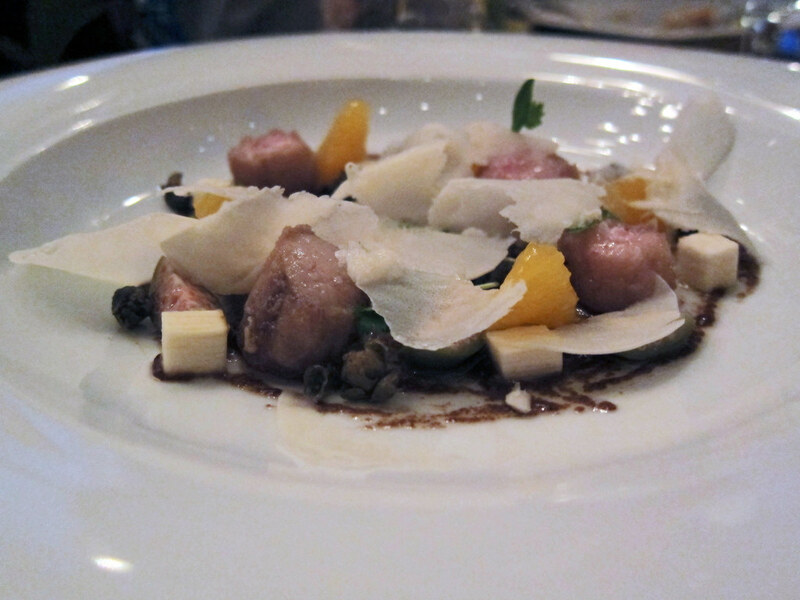 "Bone Marrow" ($17) accompanied plump, tender nuggets of beef marrow with cubes and shavings of fresh hearts of palm from Hamakua Farms in Hawaii, citrus, capers and a tart vinegar glaze. I was actually anticipating some play on the similarity in appearance of the outer layers of palm hearts to marrow bones, but this eschewed visual puns for flavor, and was an intriguingly different use of the star ingredient. 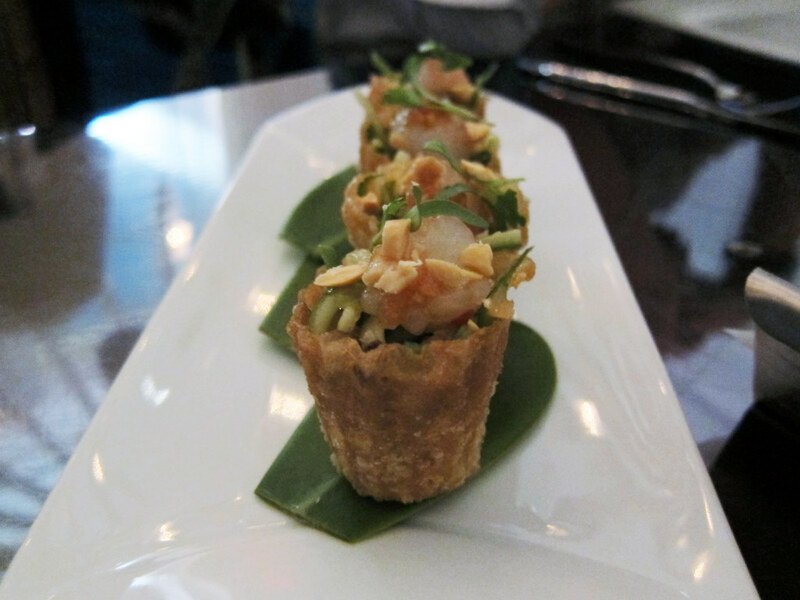 For the high-roller set, the most luxurious item on the menu may be the "Jose's Taco." 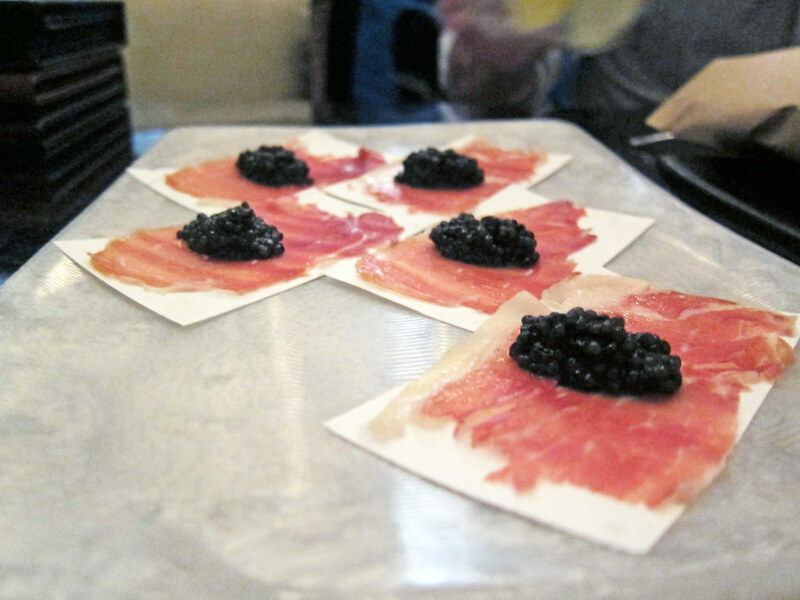 ($50) As I said when I first tried this combination of jamon de ibérico and caviar at é, the "salt-on-salt" combination actually works surprisingly well, bringing out different aspects of the meaty, marine, salty, sweet and nutty flavors of each of the components. 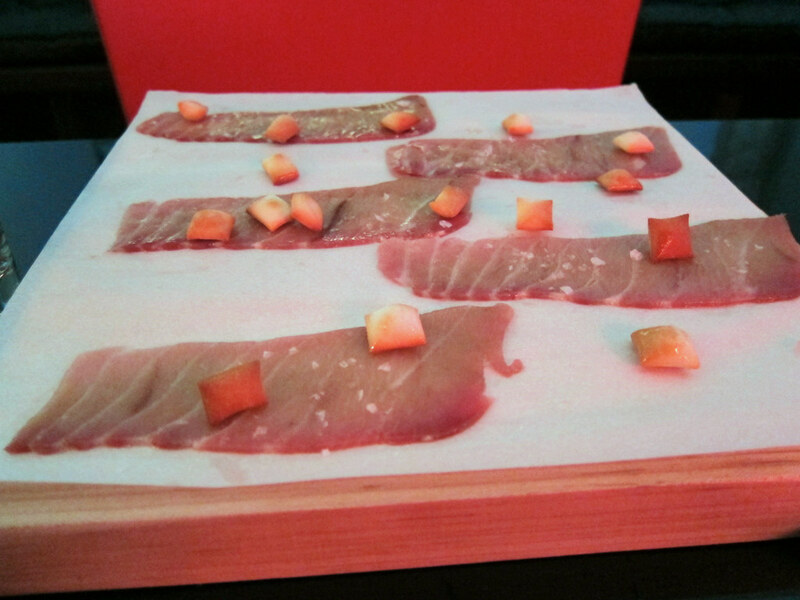 Only slightly less extravagant is the "Jamon de Toro," ($27), luscious fatty tuna belly that's been salt-cured and then rubbed with jamon de ibérico fat, sprinkled with crispy bread cubes for service. Maybe you're in the mood for a sandwich? 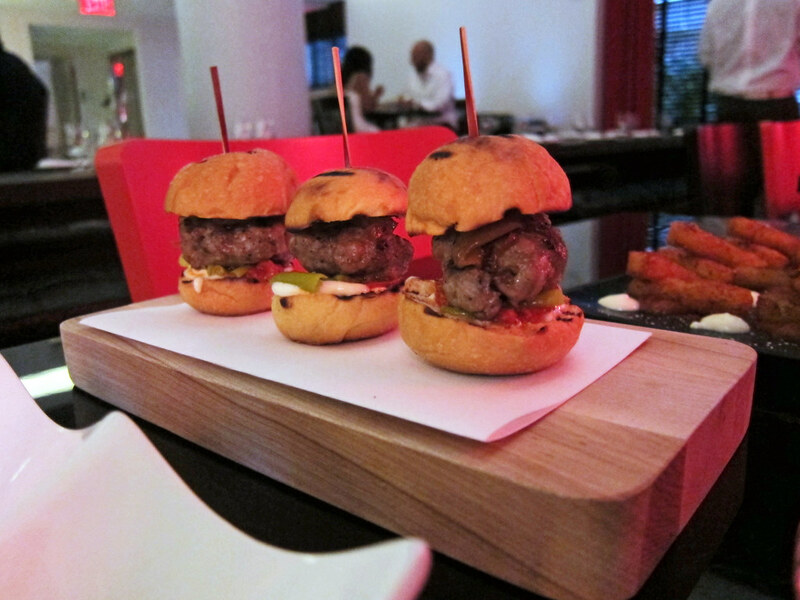 How about a "Cubano" ($12 per piece). 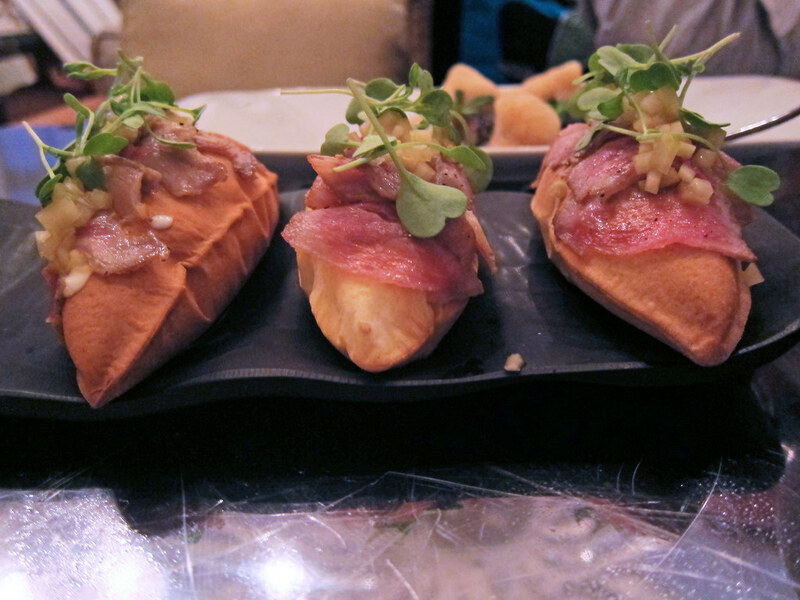 A localized twist on the "Philly Cheese Steak" they used to serve at minibar, this ought to be a "signature" dish for Bazaar South Beach: light, hollow "air bread" filled with melted Swiss cheese, and topped with jamon ibérico, secreto de ibérico, mustard and finely chopped pickles. 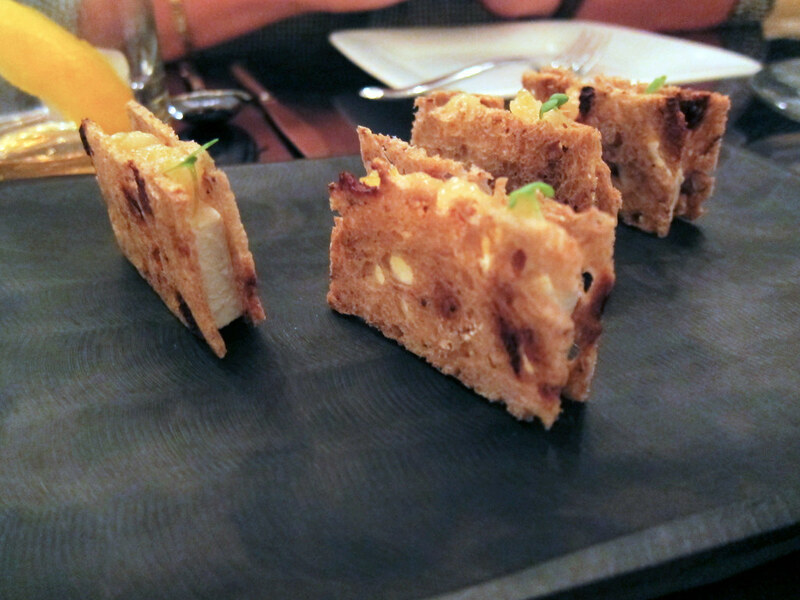 But I found the components didn't quite balance right, dominated instead by the liquid cheese inside the bread. 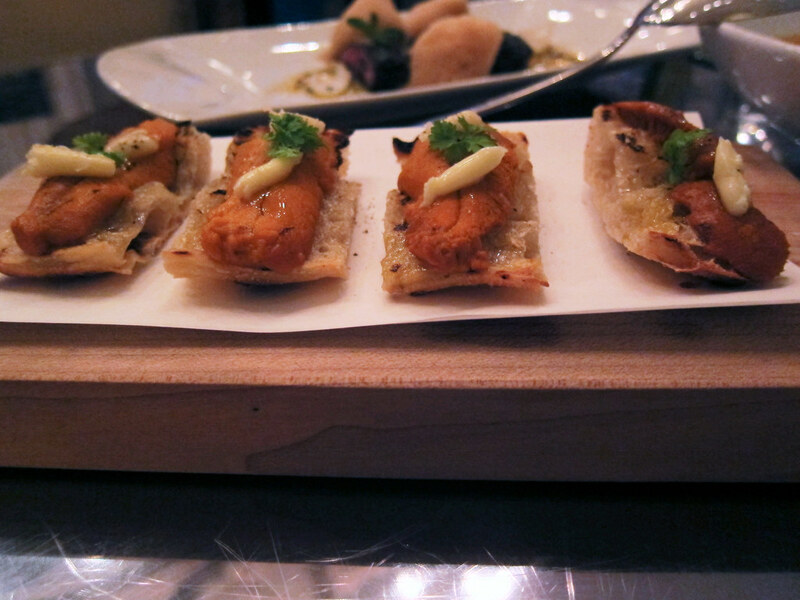 Instead, I preferred the "Butifarra Flautas" ($18), basically pork sausage sliders, rounded out with piquillo peppers, aioli and tangy pickled piparra peppers. Despite the Spanish penchant for the porcine, the menu actually features a pretty extensive number of fruit and vegetable based dishes. Indeed, entire subsections of the "Miami" and "Spain" menus focus on vegetables. One of my favorites was a great Asturiano / Catalan combination: "Escalivada" ($10) - a classic Catalan eggplant, pepper, onion and tomato stew, slow roasted and then allowed to steep in their own juices - along with Cabrales blue cheese from Asturias, all crowded onto crusty toasted bread. 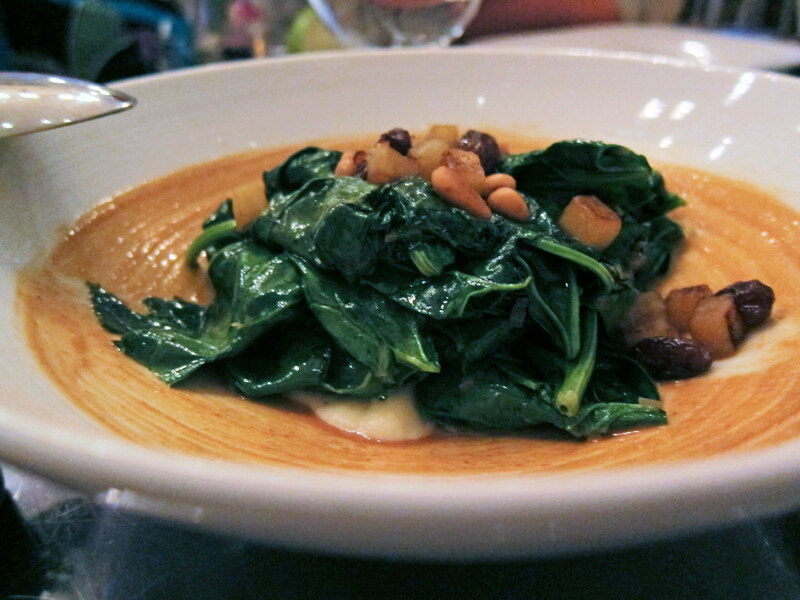 Andrés "Catalan Spinach" ($10) is a fairly classical recipe I've made at home to great success, with cubed apple, raisins and pine nuts all browned together in oil, then tossed with fresh spinach until the greens wilt. (You can get the recipe here). Mine is good. Bazaar's is better. 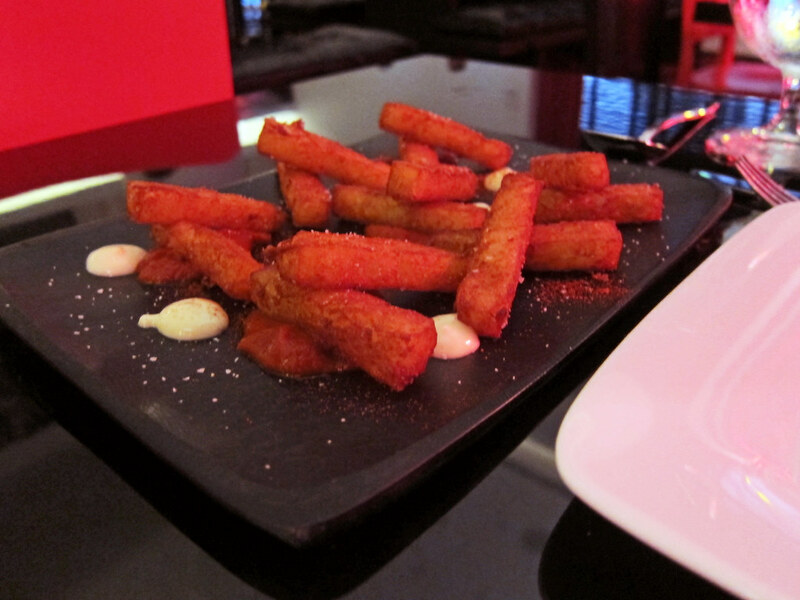 "Patatas Bravas" ($10) is another classic spanish tapa, done here in an unclassical form. Though the potato sticks - almost like a croqueta, crispy outside and creamy within - were fancier than the usual cubes of fried potato, the sauces here - a silky aioli and a spicy "bravas" sauce, redolent more of pimentón than tomato, were pitch perfect renditions of a traditional version. 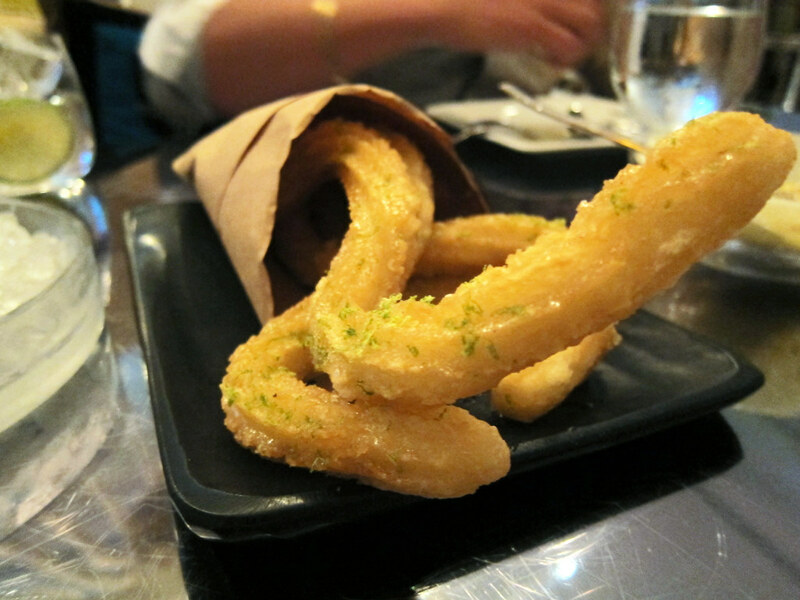 I didn't expect to like the "Yuca Churros" ($12). But these twisting tubes of fried dough, with some of the starchy texture of yuca and some delicious peanut butter and honey for dipping, were an unexpected treat. 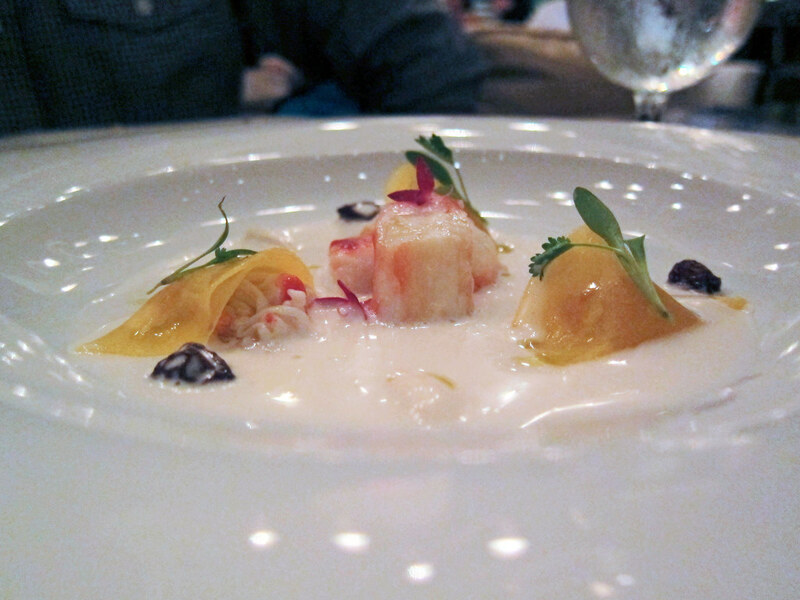 On the more delicate side of things was an "Ajo Blanco" ($12) with ribbons of mango wrapped around king crab, Pedro Ximenez sherry "ravioli," and chewy fresh almonds, all swimming in a shallow pool of creamy almond milk. This was a recapitulation of a dish I had at minibar back in 2008 that absolutely floored me at the time; it's still great four years later. I'm not a big dessert person, and often substitute cheeses for dessert. 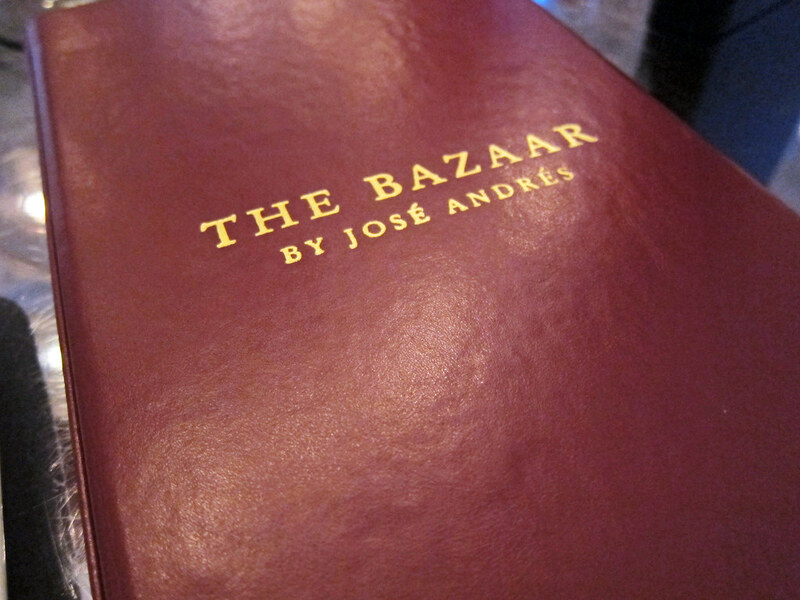 Though they are not advertised as such, the Bazaar menu has a couple items that fit this bill perfectly. The "Baby Japanese Peaches" ($18) with burrata and hazelnuts is another of my favorites at Bazaar. The peaches - olive-sized, bright green orbs that can be eaten whole - are paired with burrata cheese, which has been reshaped by spherification into smaller, oozy balls that duplicate the texture of the original product. A hazelnut picada underneath brings this dish still closer to a dessert, while little toasted cubes of bread keep it from veering into too sweet territory. 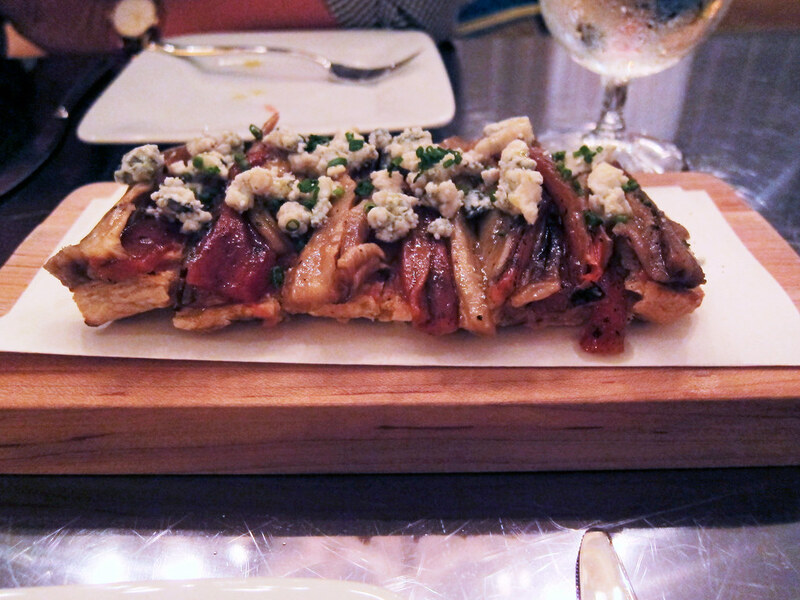 Another possibility as a not-too-sweet finisher is the "Blue Cheese Sandwich ($13 for four pieces), with a plank of frozen blue cheese sandwiched between razor-thin slices of walnut bread, with a dab of lemon marmalade to brighten the flavors. The frozen blue cheese is something Ferran Adria started doing some time ago. Here, it mutes the sometimes pungent flavor of the blue cheese, but creates an intriguing textural contrast, going quickly from crisp to soft from the warmth of your mouth. 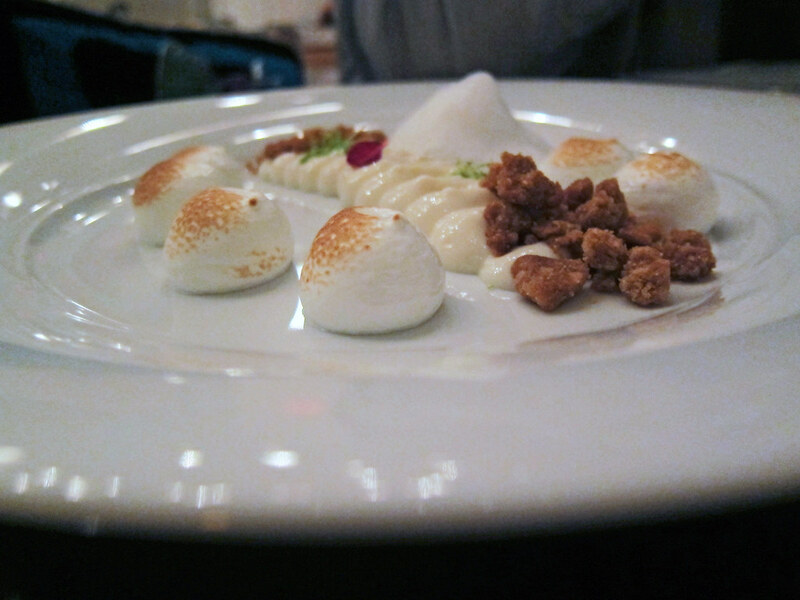 Those seeking sweeter desserts have options too, like "Key Lime Pie José's Way" ($12), deconstructed into a creamy key lime curd, balls of toasted meringue, and graham cracker crumbs, which combine to taste like something uncannily resembling a key lime pie. 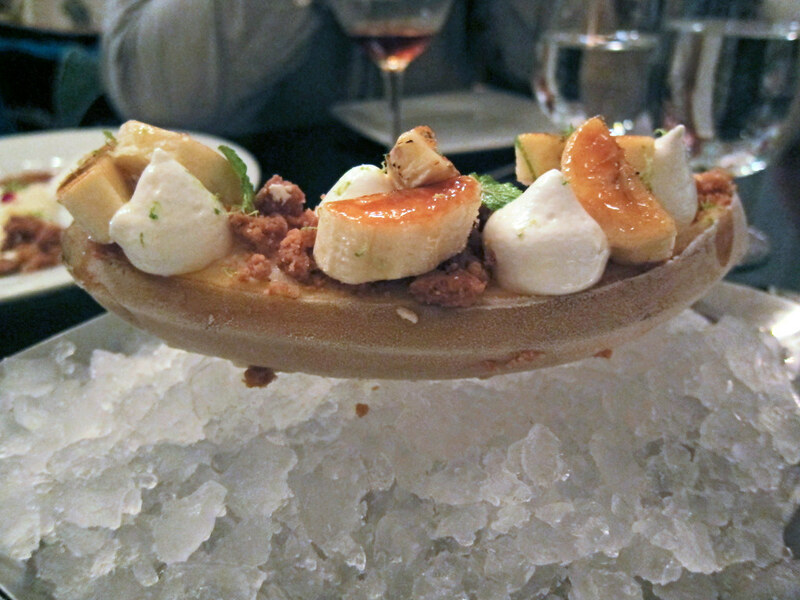 The "Banana Mojito" ($12) is another play on the local flavors, with a frozen banana serving as the vehicle for a mojito sorbet, bruleed bananas and puffy mint whipped cream. Other options include a "Tembleque" of "jiggling coconut" with mango and cinnamon, a very traditional flan, and a dark chocolate mousse cake accompanied by vividly flavored Cuban coffee ice cream. So - after three meals and nearly forty dishes (yes, there were still others I tried that I didn't describe here) - how do I feel about Bazaar? 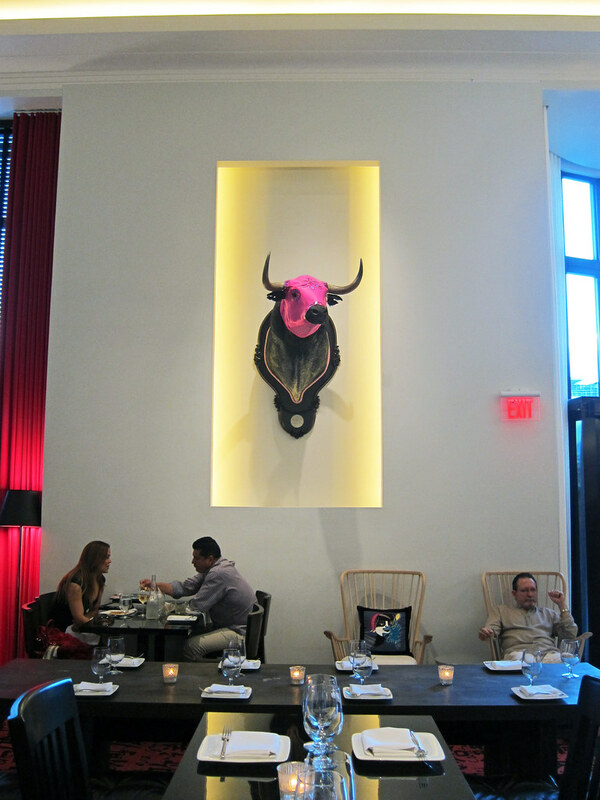 Let me state it simply: this is already one of the top restaurants in Miami. It is not exactly ground-breaking, and it is not entirely flawless. 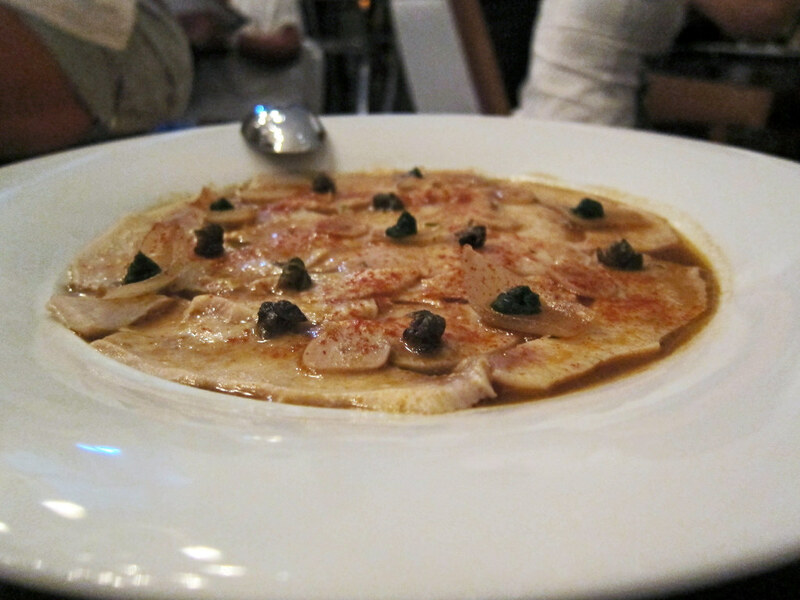 But the food is flavorful and fun, sometimes even complex and elegant. The menu is ambitious and diverse. 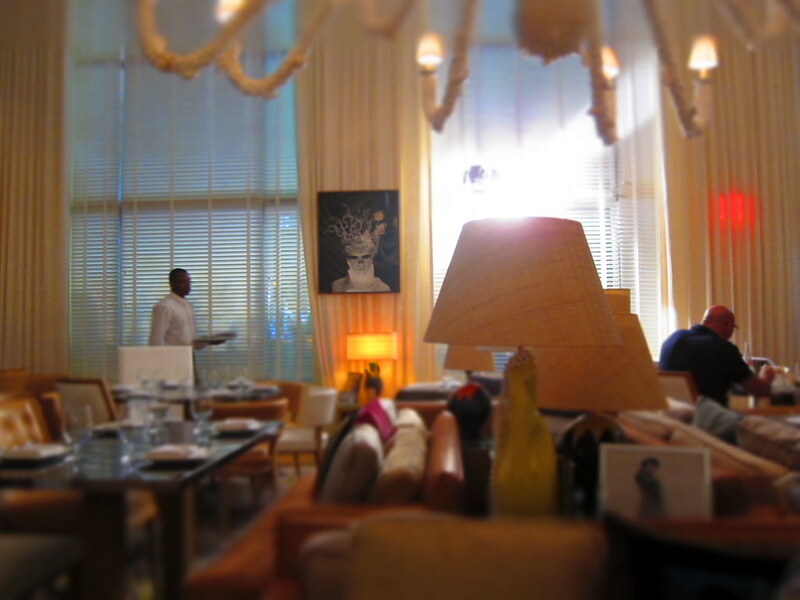 The space, and the staff, all exude elegance without stuffiness. It is a relief to see a chef come to town and not feel compelled to dumb down the brand, but instead seek out ways to expand and adapt it to the local audience. Chef Andrés: welcome to Miami; we're glad you made it. Hat tip to The Chowfather. I usually would not be writing about a restaurant so early after its opening, but I've already made three trips to Bazaar and tried about 2/3 of the 60+ items on the menu, some multiple times. 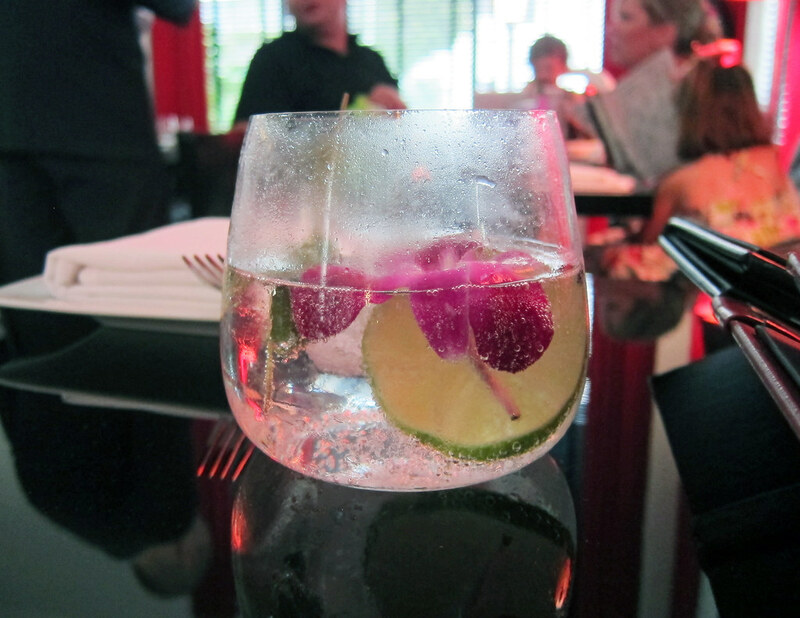 I expect the restaurant will continue to evolve - every restaurant does - but it's already doing a lot very well. I should probably note early on here as well that I was "spotted" from my first visit here, when the GM, Giancarlo Pagani, came by our table after I took out a camera. Subsequent visits have been with Chowfather and/or Steve BM, both of whom have pretty much moved into the SLS and are already official regulars. All meals have been paid for but some have included a few extra items sent out to the table, which we've done our best to make up for by being generous tippers. So take my comments with as many grains of salt as you deem appropriate, which I hope you always do anyway. More on "Miami Meets the World," including the "Singapore Connection," below. Well, part of the kitchen, anyway. 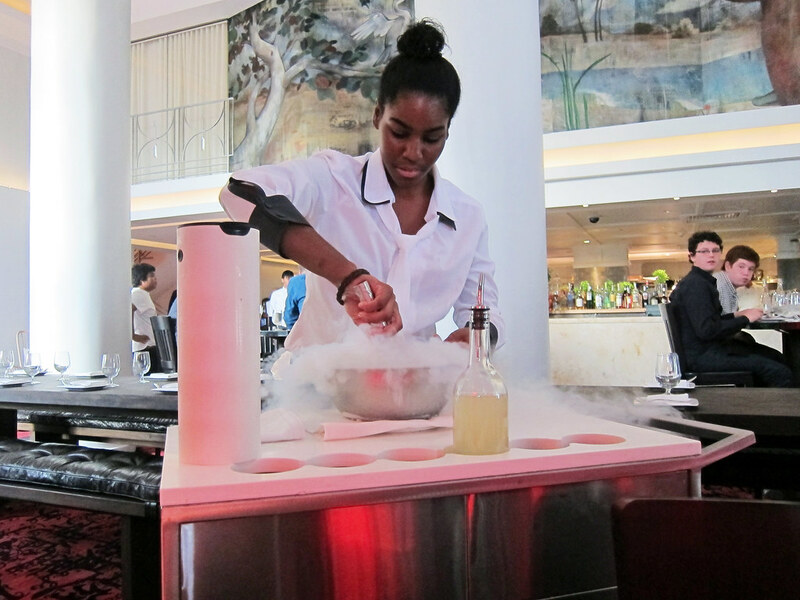 Another quirk of the old Art Deco hotel layout is that there are actually at least three different kitchen spaces: one behind the bar in the Rojo Room; another on the opposite side of the dining room; and still another area behind a bar in the Blanca dining room that's also used for prep space. But as one of the chefs pointed out to me, Chef Andrés is used to working with unusual spaces, including the three-story layout of the Café Atlantico building (which then became America Eats Tavern). Who also founded the charmingly goofy Kukuxumusu clothing firm. The restaurant in fact was designed by Phillipe Starck. At Joe's Stone Crab, you can get stone crabs for upwards of $50 an order. You can also get a fried 1/2 chicken for $5.95 - and it's some of the best fried chicken in town. Other drink options include several modern or classic cocktails (from a margarita topped with frothy salt "air" to a Singapore Sling), white or red sangrias with a showy tableside presentation, and a very solid, Spanish-focused wine selection that is both regionally diverse and fairly reasonable in price, with many good choices in the $40-70 range in particular. I don't know that they've started yet, but have been told that Bazaar is going to start doing tasting menus at different price points - i.e., $75, $100, $125 - where they will select the dishes and compose a menu. It would be a great option to have available. A side note here on pricing: this is a tapas-style small plates menu, but let's be realistic - this is not a tapas bar. You can not pop in, grab a bite and a beer and leave for under $10. But if you order right, I think you can have a diverse, exciting and satisfying meal - especially with a few people - for around $50 per person. And you can even have a real blow-out meal for about $75 per person provided you limit your intake of jamon ibérico and caviar. I've compared the prices of similar items to the Jaleo D.C. menu, and most items, it seems, are marked up a $1-2 South Beach premium; however, it seems there's an unofficial $10 floor: several $7 items on the Jaleo menu are priced at $10+ here. 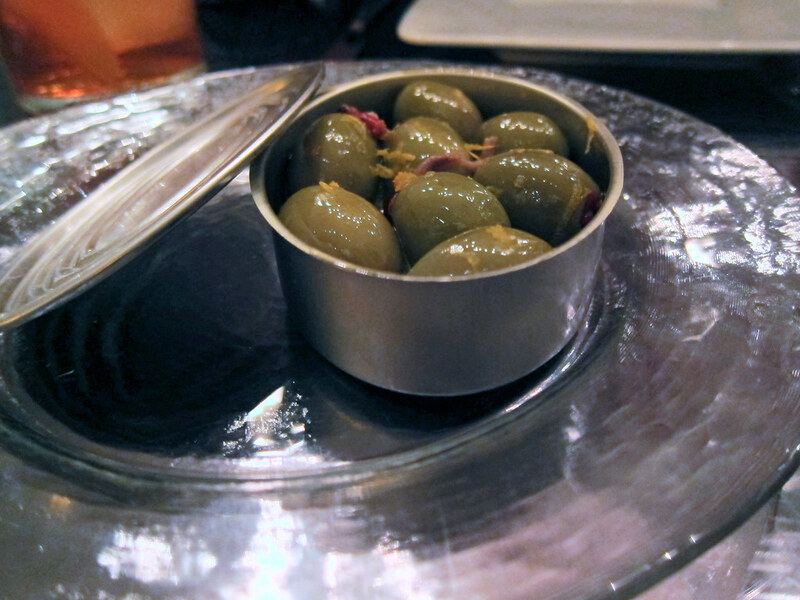 There is a tapas bar in Barcelona, Quimet y Quimet, that focuses almost exclusively on tapas assembled from canned goods, some of which are aged in their cellar for several months. These were excellent, though not as good as the outstanding - and very similar - rendition I had at Asador Etxebarri, which was even plated in the same fashion. The Chinese / Mexican connection is equally tenuous: "What brings Mexico and China together? You could start with the Spanish galleons that first sailed the Pacific in 1565 in the reign of King Philip II. Along with the lucrative trade in silk and silver, they brought Asian spices and fruit to Mexico, and New World peppers to the Middle Kingdom of China. They also brought the legend of an Asian girl kidnapped by pirates and shipped to Mexico, known as La China Poblana." Chef Jorge Hernandez, who was on loan to Bazaar from minibar while the latter undergoes refurbishment and expansion, told me the "secret ingredient" in the chili sauce is pimentón, the Spanish smoked paprika that makes so many other things taste good too. Chef David Thomas, who Andrés poached from Thomas Keller's Ad Hoc, is Bazaar's Chef de Cuisine, but there have also been a rotating crew from Andrés other restaurants coming in and out of the kitchen during its first month. Though he wasn't here for the opening, Andrés has been in several times over the past weeks, including multiple rapid-fire tastings through the entire menu, following which several dishes get tweaked and refined. No matter how high-profile the opening, Bazaar, like any restaurant, is a work in progress. A description that could also hold true for significant portions of South Beach's population. 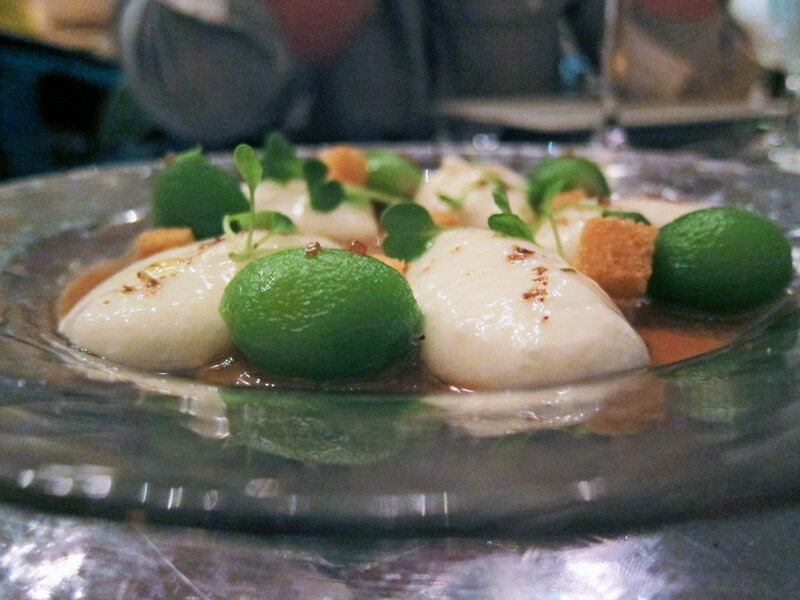 Thomas Keller has done a similar play at French Laundry, stuffing hearts of palm with a purée of marrow beans. "Secreto" is a cut from behind the shoulder with a rich texture similar to skirt steak, which used to be the "butcher's secret." I had a lengthy discussion with one of the bartenders at Bar Centro, the outdoor bar area behind the restaurant, about Bazaar's pan con tomate - an item which, along with maybe tortilla española, is the barometer for a good tapas bar. She said that they brought bread over from Spain to show their local baker what they were looking for. And it worked: the bread is crusty but not toothbreakingly hard, and just absorbent enough to soak up the vegetable juices without going soggy. 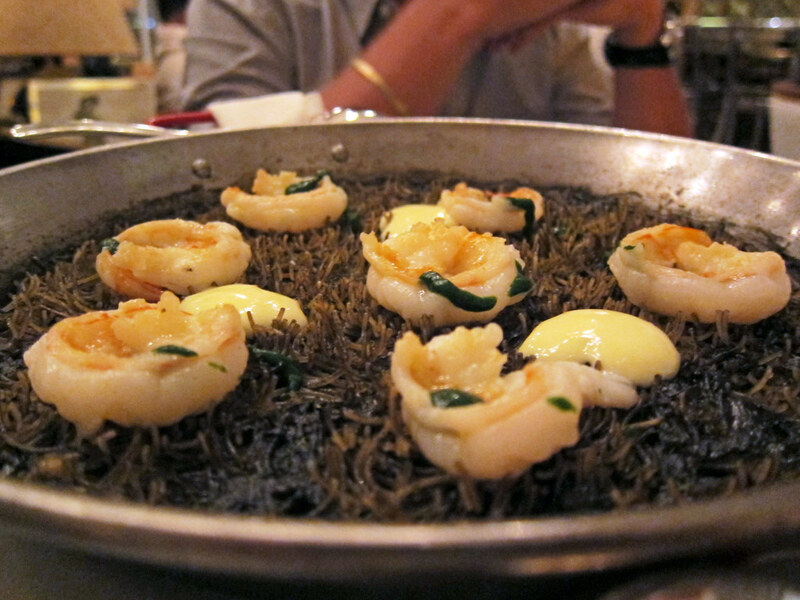 Which highlights one of the other things I've enjoyed at Bazaar: just about all of the staff seem both knowledgeable and passionate about the restaurant and its products. Though I suppose there are limits: try as I might, I can't convince anyone over there to do a minibar / é / saam type concept in Miami. Given how labor-intensive those operations are, I understand, though I can't say I'm not disappointed. Great Post. Objective, thoughtful, informative as always. Shame some of us had similar comments on some of the dishes early on (the baos, the ceviche) and got bullied by Jose Andres fans. Let's refresh your memory on the second visit from your own tweets. Don't look to bash.. #open minded. I've been 4 times and LOVE it!! I predict that it won't be around in six months. It was very difficult to appreciate and enjoy the food because the service was so sloppy and disorganized. Dishes were ridiculously priced and minuscule in size. This restaurant is more about "the scene" and unfortunately less about the food. I would be willing to bet you dinner that it will be around - and packed - in six months. I can't really speak to service issues - I've not experienced them personally, I've heard from folks who went opening week who did have some, I did not see any visibly unhappy or neglected tables on my subsequent visits. Complaints about the pricing / portion size I find kind of goofy. There are 60+ items on the menu, and the average price point is about $14 (and would be less if you dropped big ticket items like the $50 Jose Taco). 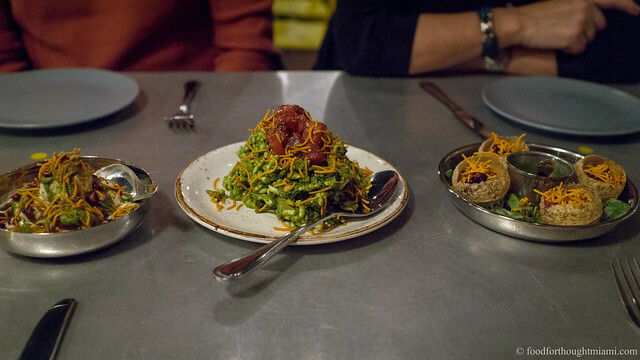 Yes, the prices may be nearly twice what you'd pay at a homey little tapas bar like Xixon, but the surroundings are a whole lot nicer, the ingredient quality is higher, many of the dishes are a lot more complex. You can order 8 things between 2 people and pay a little more than $50 per person, which is easily what a meal would cost at a comparable venue anywhere on South Beach. Couldn't disagree more that the restaurant is about the scene and not the food.